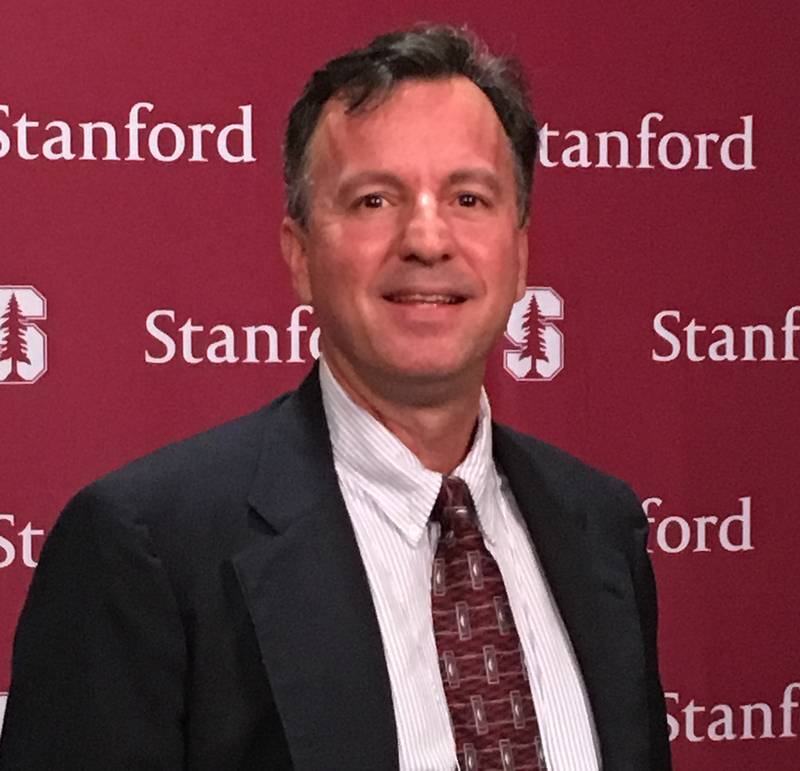 Steven Cole (Economics, MBA - University of West Florida , Business & Innovation - Stanford University) 22 years of experience in the reflective safety business. Specializing in vehicle accident and rear end collision reduction through increased visibility. Retro reflective tape is defined as a film that through the use of glass spheres or man made prisms, reflects light or radiation back to its source. Glass bead tapes reflect using microscopic glass beads that act as parabolas and direct light back to where it came from. Prismatic tapes use man made prisms or mirrors to collect light and send it back to its source. When a transparent color is applied to the surface of either tape the light that is reflected is colored. Reflective and Retro-Reflective surfaces are often confused with each other. A surface that is Retro-reflective is always reflective but a surface that is reflective is not always retro-reflective. For example, a mirror is reflective but not retro-reflective. One of the most important features of retro reflective tape is its ability to collect light, change the color of that light and send it back to its source. That is why stops signs are visible at night in a red color. Yield signs are visible at night in a yellow color. And so on. Without this feature, night time driving would be different than it is now. The types and colors of reflective tapes are mind boggling. The huge variety of applications are what create the need for all the different intensities, types and colors. For example, trucks need a bright red and white alternating dot tape that can be seen from thousands of feet away. Life vests need a super bright white tape that can be seen from even farther away. The life vest needs a sewable reflective tape whereas the truck does not. Stop signs in neighborhoods can basic affordable reflective tape that uses glass beads for reflectivity. However, street signs on interstates need a more expensive prismatic film. Distance is what dictates this necessity. This is an information site that provides information about the products available in our online stores. Our online stores are as follows. This seems like a simple task but in fact it is quite complicated. Just like a portrait that stares at you no matter where you are in the room, reflective tape reflects light back to the source and the source only no matter where that source is positioned. Think of it this way. If you were in the correct position in front of a parabolic shape like a satellite dish and threw a ball into the dish it would always bounce back and hit you. If you throw a ball into the corner of a racquetball court it will hit one wall, then the other, and then come back to you. (In both examples you need to be in the right spot.) Glass bead retro reflective tape (original technology) would be like the satellite dish and prismatic retro reflective tape (newest technology) would be like the racquetball court. The picture below shows 4 types of tape side by side photographed at different distances with a flash camera. The two tapes on the left are glass bead tapes (engineer and high intensity). The two tapes on the right are prismatic (V92 and SOLAS) As you can see the prismatic tapes are visible from much farther away. Oftentimes, reflective and retro-reflective are confused with each other. All retro-reflective surfaces are reflective but not all reflective surfaces are retro-reflective. Consider a mirror. It is reflective. However, if you shine a light on it at an angle the light will bounce and hit somewhere else. That is because it is reflective but not retro-reflective. If the mirror was retro-reflective the light would always come back to you. Here is a diagram that will visually show you how these films work. 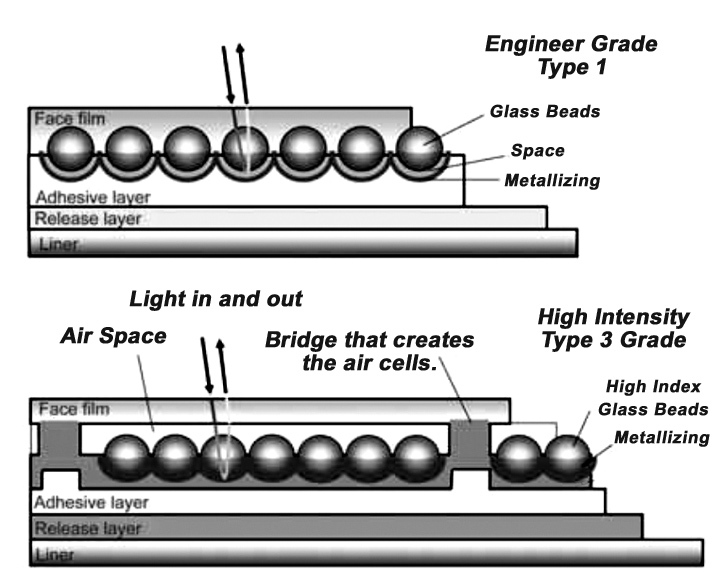 The first diagram is of a glass bead type reflective film. This is the original technology. The tapes are about 30% efficient and tend to disperse light back in a wider spread. For close up applications this is actually a good thing but for distance applications it is not. The pattern is similar to a flood light. Bright up close but not as bright at a distance. Lastly, it is important to remember that the tighter the beam, the more your eyes need to be in line with the source of the light for you to see it when it is reflected back. Car headlights and the drivers eyes are in this basic configuration which is why the driver and passenger see the street signs light up and a by-stander off to one side will see no reflection at all. Reflective tape is made using machines that bond together multiple layers of material into one film. There are two main types of reflective tape, glass bead and micro-prismatic. They reflect in two different ways but are made in similar fashion with glass bead tape being the less complicated of the two to product. The image below shows the 4 types of reflective films. All are made in a similar way. 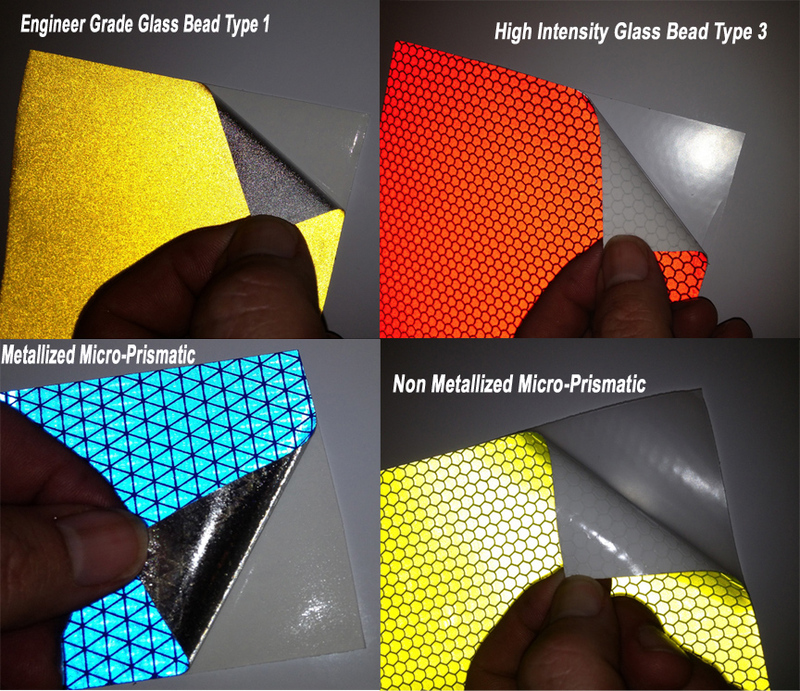 The glass bead engineer grade film is the easiest to make and thus the least expensive. The high intensity is the next easiest and next in price. 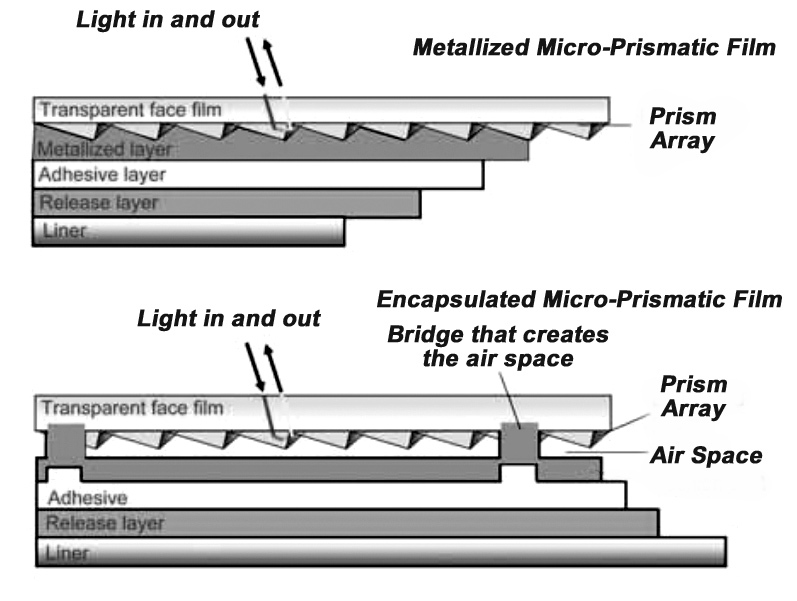 The metalized micro-prismatic films are the most expensive to make but are the brightest and toughest of all the reflective tapes. They are perfect for dynamic or harsh environments. The non metalized films are less expensive to make than metalized films. Non metalized films have the advantage of being more vivid in the daytime and are popular for sign sheeting and other static applications. The word “retro” is the key to understanding the difference between a reflective surface like a mirror, and a retro reflective surface like a bike or automobile reflector. Retro means to go back or backward. In the reflective tape industry it means to return light back where it came from and no where else. 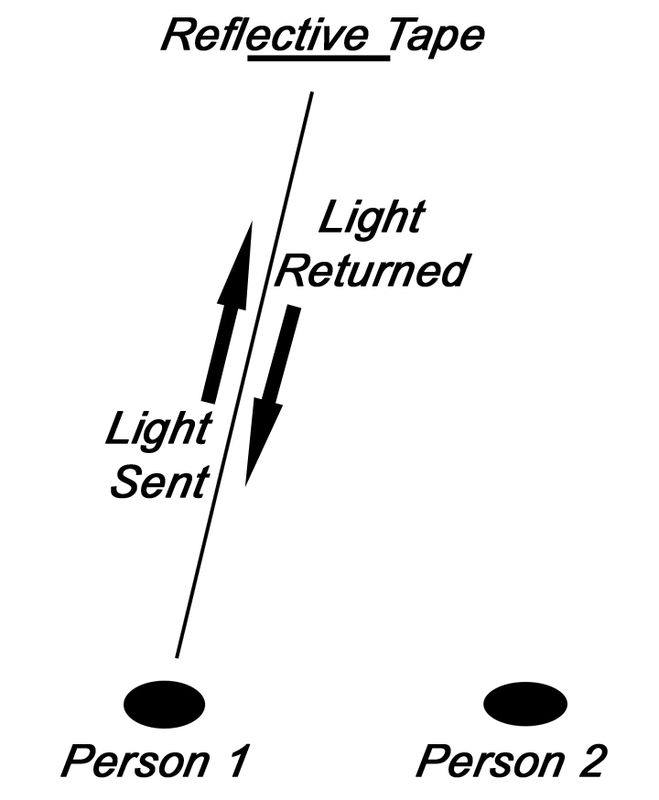 A mirror is reflective but not retro reflective because it sends light in different directions depending on the entrance angle. If light was a tennis ball it would be like throwing the ball at a wall at an angle. The ball would hit the wall and ricochet at an angle very similar to the one that it arrived on only the other direction. Now imagine a wall that curved around you so that when you threw a tennis ball at it the ball would always return to you. That would be called retro reflective. The diagram below illustrates this. How a retro reflective surface works is a matter of geometry. Glass bead retro reflective surfaces use glass spheres to collect light and bounce it back to the source. The rounded shape of the beads is what creates the retro reflectivity. Prismatic surfaces do the same thing but with sharp angles like prisms. They work like the glass beads but are more efficient thus creating a brighter return of light. There are two types of reflective tape, glass bead and prismatic. Glass bead tapes were the first reflective tapes and then in the 1960’s prismatic tape was invented by Reflexite. It is interesting that prismatic tapes have not replaced glass bead tapes. Even after 50 years. This is because both have characteristics that make them desirable in certain situations. Glass bead tapes use microscopic glass spheres to bend and reflect light back to the light source. Because of the imperfections and curved surfaces in glass beads, tapes made with beads are less reflective than tapes made with prisms. Glass bead tapes are about 30% efficient. This is a disadvantage. However, there are three advantages that glass bead tape has over most prismatic tapes. 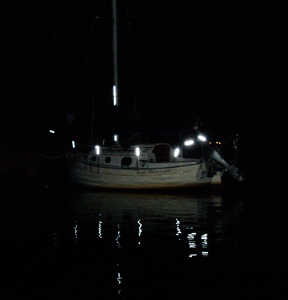 First, glass bead reflective tapes are much more affordable. This is because they are simpler to manufacture. Second, most glass bead tapes are CAD cuttable meaning that you can cut letters, number and designs out of the tape and create reflective signs or graphics. Third, glass bead tapes reflect light back at wider angles. In other words, glass bead tapes are sort of like flood lamps whereas prismatic tapes are more light spot lights. The diagram below shows this. As you will notice from the diagram above, the glass bead tape disperses light more than prismatic tape. That is why it is not as bright at farther distances. However, at close distances the wider angle of dispersion can be an advantage. Let say for example that a fireman is wearing a high intensity glass bead tape on his equipment. When someone shines a light towards him the tape will light up for the person with the light and, if you are fairly close, it will light up for you as well. Also, as the beam nears the fireman, his tape lights up quickly. Again, this is because of the dispersion of the light. Many people prefer the high intensity glass bead tape for close up applications. For long distance applications the prismatic is always better. This is because the glass bead tapes completely disappear at a distance of a few hundred yards whereas a prismatic tape is still visible for over a thousand yards or more. There are two basic types of glass bead reflective tapes. The first is a standard engineer grade or type 1 tape. White engineer grade tape reflects at about 75 candlepower. This is the most popular tape and is found on car tags, stop signs, speed limit signs, emergency vehicle striping and graphics, etc.. The second type is high intensity or type 3 tape. This tape has higher index beads and encapsulates them in a honeycomb pattern. White high intensity tape reflects at about 250 candlepower. You will find this type of tape on traffic cones and road barrels. Prismatic is more efficient and returns about 80% of the light sent to it. Therefore it is brighter than glass bead tapes. Prismatic tape reflects light via man made prisms. Since the mirrors are flat and not curved they are more efficient. 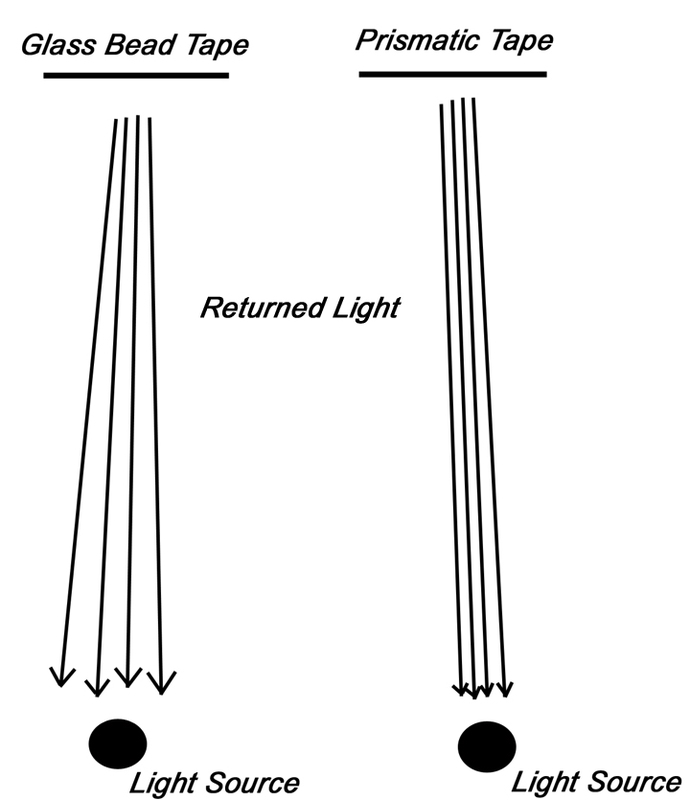 The light sent from the tape is more focused and can therefore travel farther still be seen. For long distance applications like DOT regulated trucks or coast guard search and rescue a prismatic tape is a must. 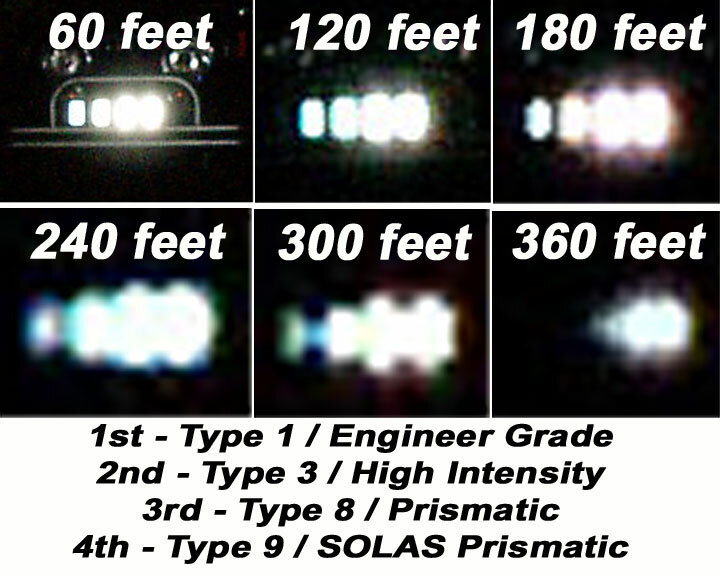 There are several grades of prismatic tape starting with a type 4 and going up to a type 8. Because they are all so bright, to the human eye there is very little noticeable difference in the various prismatic types. It is when you get far away from the tape that you notice a difference. The farther away you need to see the tape the higher the type needs to be. The brightest tape that I know of is SOLAS coast guard approved tape. It is used for offshore applications and is vital for search and rescue operations where the victim may be a thousand or so yards away. Many prismatic tapes are too thick to CAD cut. The exception are Reflexite tapes. Reflexite invented prismatic tape make the tape in a thin single layer. This has two advantages. Number one, the tape will not delaminate like the thicker tapes. Number two, it can be CAD cut with a vinyl cutter/plotter. This is a huge advantage. Prismatic graphics show up several times farther than standard glass bead graphics. The advantages of this are obvioius. Some different types of prismatic tapes are DOT C2 Tape, FRA Railcar Tape, SOLAS coast guard tape, School Bus Tape, Chevron Reflective Striping, and Sign Sheeting. In summary, both glass bead and prismatic tapes have their purpose and will continue to keep people safe and visible for years to come. Reflective tape reflects in one of two ways. Either through the use of microscopic glass beads or via man made prisms. Glass bead technology is the oldest and prismatic tapes are more recent. Note – prismatic reflective tapes were invented by Reflexite Americas in the 60’s. Glass bead tapes reflect light back less efficiently than prismatics. However, glass bead tape is much less expensive. For applications within a 300 foot range they are fine and sometimes preferable. Prismatic tape has a tighter more efficient return of light. A brighter, tighter beam extends much further giving prismatic tapes an operating range beyond the thousand foot mark. For marine, highway or traffic applications where long distance conspicuity is important, prismatic is the way to go. The diagram below shows the dispersant characteristics of each type of tape. Glass bead tape reflects light back sort of like a flood lamp. Up close this is fine. Prismatic tapes shine like a spot light. This is better when the viewer is far away. What is the difference in brightness? Lets compare the color white/silver. White Glass bead tape reflects at about 75 candelas for the standard engineer grade type 1 tape (like your car tag) and 250 candelas for the high intensity type 3 tape. Prismatic tapes start at around 460 candelas and go up to 1000 candelas for SOLAS tape. As you can see there is a big difference in the two tapes. Each has its function and neither will ever become obsolete. This type of film is often referred to as an air backed prismatic. Non metallized films are made by first creating a prismatic array. This can be clear or colored. This layer is then laminated onto another layer that provides a white background for the top prismatic layer. These films are normally more vivid than metabolized films since they use a white background versus a metallized mirror background. The downside is that the two laters can delaminate. It is also thicker and less flexible. This this type of film is great for signs and other static applications but for vehicle graphics a metallized film is a must.